but the strange part of this is "classic" Star Wars games Super Star Wars, Star Wars: Racer Revenge, Star Wars: Jedi Starfighter, and Star Wars Bounty Hunter which will have trophies & enhanced graphics will also be part of the bundles and certain editions of each game. Any of this tempting you to pick up a PS4 or maybe swap for one these as it's 1TB or does this marketing & partnership not sit well with you? Is that the ugliest controller everyone has ever seen? It looks worse than an N64 control. 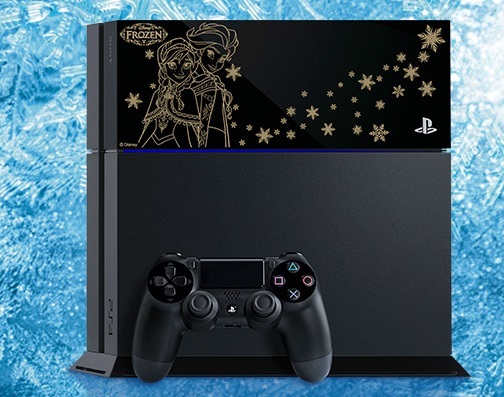 To be fair, if I was ready to buy a PS4 yet, this'd be the one. If it was 1TB, I would of been very tempted to go get one. Not sure Andy there's a lot of bad 3rd party ones out there. It's mainly the white analogue sticks i think. Also when I seen some mention a "Vader" ps4 on twitter I thought they meant this chap. To be fair, nobody has it yet so it might be chock-a-block with easter eggs. At first glance, the xbox looks better. And Playstation even has an R2 button so they're missing a trick there! Don't forget the PS4 comes with 4 "classic" games though. It's a pretty bad looking console though. But so is that 360. I'll say one thing for the ps4, it at least has colour unity across the controller and system. Between the two, solely based on looks, I'd have to give it to the ps4. The xbone might have a less offensive controller, but it'd stick out too much in the room to be an appealing part of it once the novelty wore off in my honest and humble opinion. I actually like the look of both consoles. That Darth on the PS4 is legitimate hanging up in a room art quality with just the right degree of subtlety, shame about the slit going through his head and the controller though. The R2-60 is done pretty tastefully, nice crisp blues on white, although I'd have liked it if they managed to get the start button to also be R2's sensor. Gorgeous controller. 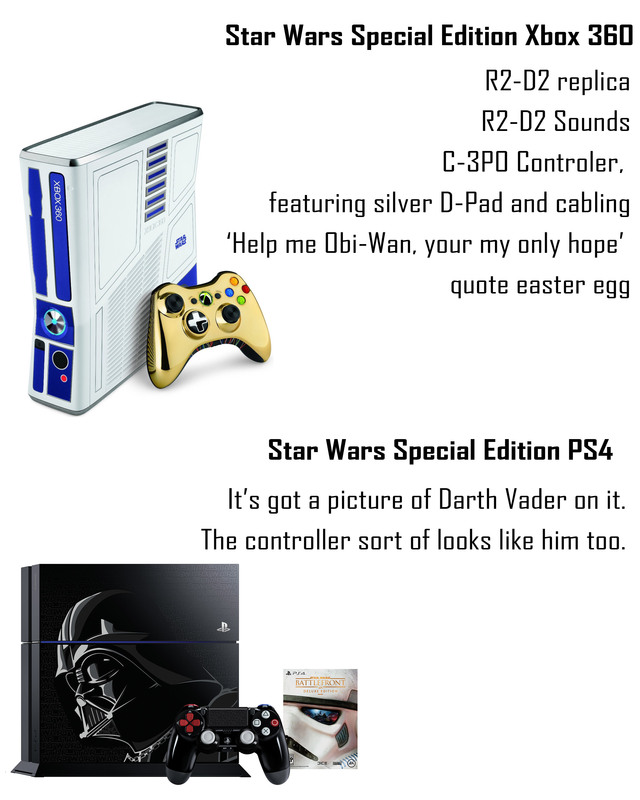 With regards to a novelty factor wearing off, for me and you yes, but the I envision the types who'd pay top dollah for a star wars console are the types for whom the novelty isn't going to diminish. The controller of the PS4 is Darth's chest. You're really good at headlines, Mas. I think it will still sale a ton of systems to the COD crowd now wanting a PS4 due to MLG & DLC. 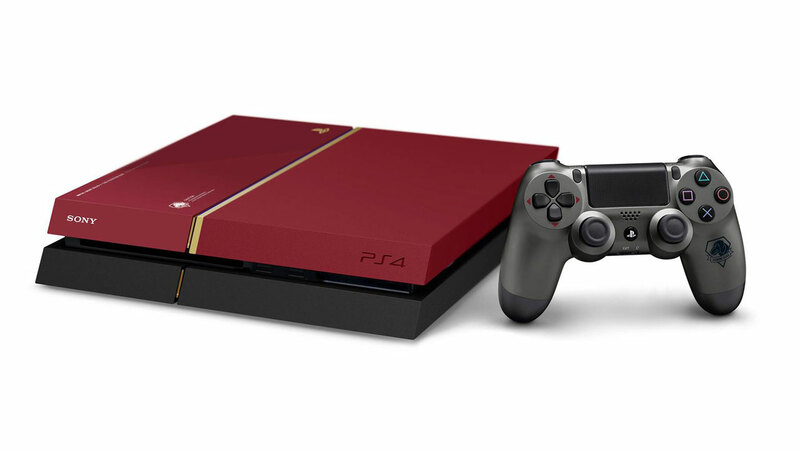 Also that makes about 20 special edition PS4's with Jay's MGSV being one of the best, I do like the FFType-O HD, Destiny: The Taken King and 20th anniversary editions though. As I said to you on twitter I don't like anything about that balck ops 3 ps4. The black ops 3 ps4 is pure "Tron's toilet after a night on the Guinness"
If I ever do buy a PS4, it'll be that Frozen one! To be honest it's a pretty damn obvious slogan to use. And it worked, you can see the online stats ans the PS4 at it's peak it had 189,191 people on and at the time this post 110,267 online where the XBONE not that far behind with it's peak being 113,696 but at the moment only 37,805 online. I'm not sure if EA access may have played a part for the high peak but seems like a drop-off as you can play Battlefront for 10hrs via access and that's a lot of time for a online only shooter and would only cost you £4 for a month worth of the service, that's how I may play the game if I can be bothered to download it. PC is miles behind at 49,137 for it's peak but 31,095 online now which doesn't seem bad compared to the XBONE. I wonder how much of the PC figures are down to the fact that EA don't really bother putting their games on steam anymore. As much as people complain about Steam, many pc gamers won't buy a game unless it is on Steam. Which isn't surprising, since U-Play is utter piss, and Origin used to be the same. Which will surely be the official reveal of the PS4 Slim which will be it's out now and the Neo more then likely which I'm not sure when it will come out now, we will likely see new games possibly Red Dead 3 along with some we've seen before likely now running on Neo and some we've not seen for awhile like Deep Down. PSVR launch will be around a month away from this event which hopefully nail what the launch line-up from everyone not just Sony. Subject: Re: The Force is Strong with this PlayStation news.